A technical undergraduate student in Vietnam is turning trash to treasure by transforming decomposing fish scales into yellow apricot blossoms (known as hoa mai in Vietnamese) – a flower typically used as decoration ahead of the Lunar New Year (Tet) holiday in southern Vietnam. 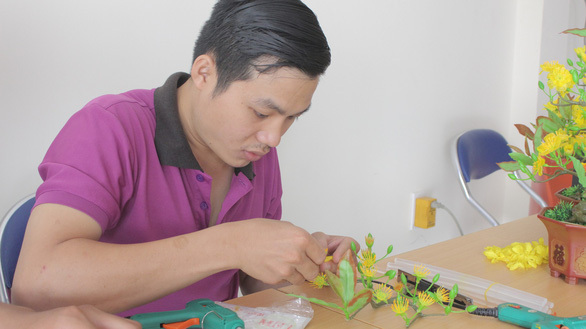 Le Ngoc Biet, a junior at the Ho Chi Minh City University of Technology (HUTECH) is hoping that the apricot blossoms he’s designed from fish scales can bring in big bucks as local Vietnamese seek out decorations for the holiday. Ngoc Biet first became intrigued with fish scales while using them to draw pictures. While studying them in detail to improve his drawings, he realized that, besides the color, the scales were eerily similar to apricot blossom petals. His attempts at fashioning the scales into apricot blossoms immediately drew attention and he was quick to find a buyer. 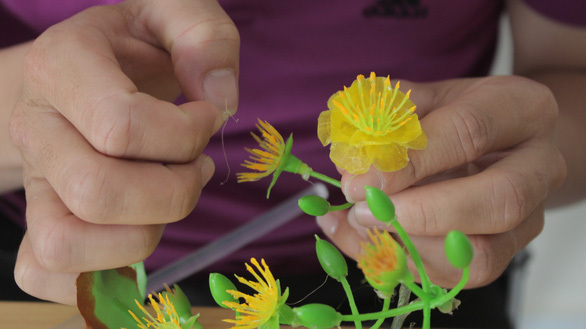 The success of his first attempt motivated Biet to take a shot at making peach flowers, a popular Tet holiday decoration in northern Vietnam. “With this vibrant and transparent material a decorated apricot blossom pot can be put on display for five to six years” said Biet. To ensure that the scales are able to stay in such good condition for so long, Biet immerses them in a special enzyme after purchasing them from a fish vendor at Do Dac Market in District 2, Ho Chi Minh City. The enzyme is meant to eliminate any odors. After drying and dyeing the scales, he applies a silicon adhesive to connect each individual scale to a dry apricot branch. Though the process isn’t particularly difficult, it does require a certain level of diligence in order to achieve the perfect positioning and color. “What I am aiming to create is a unique and one-of-a-kind product,” he shared. It took a significant amount of experimentation before Biet was able to develop the correct method for crafting the fish scales. He once dipped the scales into water for an entire month to test their integrity. Biet also researched which enzymes were suitable for the odors of each kind of fish scale. “At first, the stench was so strong we weren’t able to use the fish scales. Now, we’re used to it,” Biet shared. The most challenging part of the flower-making process, according to Biet, is that the scales often begin to curl as they dry. Because of this, he must firmly press then flat while crafting them into flower petals. Overall though, Biet admits that the process is relatively simple and that, with a little guidance, almost all of his peers could pull it off. 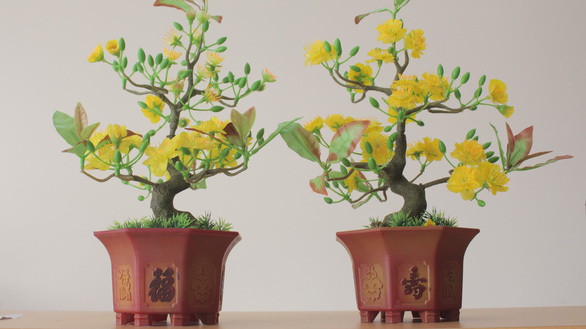 Biet currently has over 100 online orders pending for his fish-scale products, including decorated apricot branches, apricot pots, and apricot flowers. For the pots, Biet uses conventional silk-decorated apricot branches that he buys wholesale for VND150,000 (US$6.47). Then, he transforms them into his trademark products for sale from VND195,000 (US$8.42) to VND370,000 (US$15.97). “My first priority is to bring them into the spotlight and attract recognition, not to profit,” Biet stated. “Generating jobs with this technique is also one my interests,” he added. He’s offered to help anyone with extra time on their get into the profession and so far about 20 undergrads have taken him up on the offer. Fellow undergrad Nguyen Tuan, who is helping out Biet, agreed that making the handicrafts is not as difficult as people assume. “You just need to connect the fish scales to the branch using a silicon adhesive, and then voilà,” Tuan said. But Biet’s main workforce consists mostly of local residents. As the young man is fully aware of the poverty in his hometown, he is hoping it will help his neighbors generate wealth. His ultimate desire is to help solve local unemployment issues and help increase the awareness for his hometown. Biet also disclosed that he has special scaly products planned for Valentine’s Day on February 14.